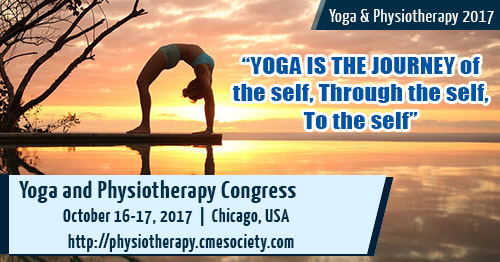 We are glad to welcome all the participants from all over the world to attend Yoga and Physiotherapy Congress on October 16-17, 2017 at Chicago, USA. A great platform for physiotherapists, Chiropractors, Certified Yoga therapist, physicians, medical representatives and related experts to discuss and exchange their ideas on Yoga, physiotherapy and latest therapies. This includes reputed keynotes talks, oral presentations, Workshops, Symposium, poster presentations and young research forums. Questions: For Questions about this event, please contact Logon Williams with Pulsus at 4084292646 or yogaphysiotherapy@pulsusconference.com.